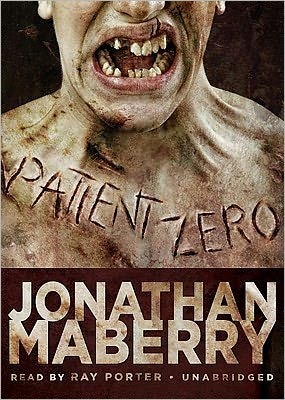 Zombie Review: Patient Zero by Jonathan Maberry (Extraordinary)! First thought when finished: This book did for me the same thing The President’s Vampire did–gave me my action/thriller love coupled with my paranormal love! *sigh* I am in love with Joe Ledger! What I Loved: There wasn’t much I didn’t love about this book! Patient Zero had heart-stopping action that any thriller junkie would love. It had a fantastic lead character, Joe Ledger, that any fan of conflicted heroes would love. He reminded me of a cross between Jason Bourne and Jack Baeur—lethal, cunning, and yet still had a heart. It also had fantastic side characters that you can’t help but adore, suspect of being of moles, and care for in every aspect. I wont’ go into any individual detail because a huge part of the fun of this book is the back-seat detective game you have going in your head. Seriously, I was sure I figured it out a couple of times. Of course, that means that I was also wrong a couple of times 🙂 I can’t say enough about this book. It is just FAN-FREAKING-TASTIC! Audio Review: I love audiobooks but this one just did not work for me. I listened to about half of the story in audio then switched over to paper. I just don’t think there was enough urgency in the narrators voice. I have listened other books Ray Porter has done and they were excellent. So I think it might have been my urgency keyed up feeling and not necessarily the narrators. So bottom line, Ray Porter is an excellent narrator but this book didn’t work for ME in audio form! Hope that makes sense because if you skip a book that has Ray as a narrator you are missing out on some true narration genius. Final Thought: Not everyone will like this book but if you are a fan of Paranormal Thrillers—you will LOVE IT! I love Jonathan Maberry, started by reading Rot & Ruin and Dust & Decay – really want to start this series with “Patient Zero”. Thanks for the review! I just think it is zombie books on audio I can't do. I tried with Rise of the Governor and had the same issue! Dear Melissa: I love you dearly but I know you—here is my warning: READ DURING THE DAYLIGHT HOURS and THEN SLEEP WITH YOUR DOGGIES! The Zombie bug is not for everyone LOL (Ok that actually sounded funny)Oh good–I am not the only one. I told Tara that I have done that with a few books for several reasons. I read faster than audiobooks go so sometimes I just wanted to know! I think you may be on to something—this is the 2nd Zombie book I have tried in Audio and it just didn't work for me. Good CATCH! I really enjoyed this one (I guess that is obvious since it got one of my few 5's) and I don't *think* you will be disappointed. Wow, those are some very cool and very creepy covers!!! I think I love the one you used at the top the best, it's creepy without scary the life out of me like the one with the teeth. Sounds like an amazing read, thanks for the review Felicia! I still need to read this author's Rot and Ruin series. This sounds like a great book. Not sure which cover I like best though. I am heading over to Amazon to look this one up. *sigh* I am a JM fan girl after reading Rot & Ruin. I was fixing to spend $$$ getting Dust & Decay & Frater's zombie series. I will have to add this one to my cart too. Glad you loved it.